We are pleased to announce that the deadline for abstract submission has been extended from December 22nd to January 5th. We invite all researchers, practitioners, and students interested in quantitative methods for decision making to attend the 32nd annual conference of the Belgian Operational Research Society (ORBEL 32) on February 1 – 2, 2018 in Liège. ORBEL is the annual conference of the Belgian Operational Research (OR) Society, a member of EURO, the association of European OR Societies, and Belgian representative of IFORS (International Federation of OR Societies). 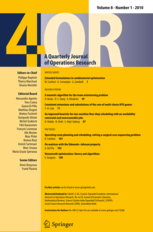 ORBEL 32 is organized by the research centre QuantOM (Quantitative Methods and Operations Management) of HEC Liège - Management School of the University of Liège. The conference is intended as a meeting place for researchers and users of OR, statistics, computer science, and related fields. It provides managers, practitioners, and researchers with a unique opportunity to exchange information on quantitative techniques for decision making. ORBEL welcomes every year more than one hundred participants from Belgium and from France, Germany, Luxembourg, and the Netherlands. The conference will take place in the main building of HEC Liège, in the heart of the City of Liège, Belgium’s third largest city and the largest agglomeration of the French-speaking Walloon region. Liège is home to the third inland port of Europe and the eighth freight airport in Europe. Recognized for its quality of life and its rich historical patrimonium, Liège is ideally situated within the Meuse-Rhin Euregio, 40 kilometers from Maastricht (the Netherlands) and 60 kilometers from Aachen (Germany). It is less than 1.5 hours away from Köln, 2.5 hours from Paris, and 4 hours from London by high-speed train (TGV) starting from the new magnificent train station designed by the renowned architect Santiago Calatrava.